Androgenic Alopecia is the term used to describe male/female pattern hair loss. This is a centuries old problem, and ever since it started, remedies were sought to prevent it. Initially man made use of natural herbs and fruits to make tonics for topical and edible use, overtime the remedies became more refined. Androgenic Alopecia affects 95% men and 20% women all over the world. For males, hair fall can start in their late teens and continue till they are 25 years old. Hair loss is either complete or partial. It starts in the crown region or the temples. The extent of hair loss varies. Unlike men, women don’t go bald completely. The loose some hair during pregnancy. Or in their late 40’s when they are close to menopause phase. Their hairline recedes because that is where thinning starts. The hair split becomes wider too. That’s it for the basic idea of what the problem is. Now we will discuss how it works and what can be done to prevent and/or reverse it. A better understanding of male/female hair loss can help us treat it. There is always more than one reason for whatever happens. Here are some of the most common factors that contribute to hair loss. This is the most basic and common reason for hair loss in men. It is a gene passed down from forefathers to the next generation and the next. If your grandparents had it, chances are your parents do too. Unfortunately there is no way to alter your genes to prevent hair loss. Well there is no way yet. Who knows, maybe in the future scientists are able to eliminate the genetic factors that affect hair loss. If you are a picky eater, we have bad news for you. Not only are you missing out on so many delicious foods. You are depriving your body of essential nutrients and minerals that help you grow. Nothing in this world is created without a purpose. Every type of vitamin and mineral is good for your body. They all work in co-relation and make sure you are healthy and active. There are billions of bio-chemical reactions happening in your body every second. These minerals, either directly or indirectly affect how your body chemistry works. Your hair need minerals and nutrients to survive. Otherwise they will become weak and fall off. Another reason for hair loss is becoming ill or getting a disease. There are some hair and scalp diseases like Alopecia Areata, Alopecia Universalis, Telogen Effluvium and Tinea Capitis. These are different type of diseases with one common and basic symptom, which is hair loss. The conditions and severity of disease vary person to person. But the end result is losing hair one way or another unless timely treated. Cancer patients lose hair because of chemotherapy and strong medications. The body’s defense mechanism is to temporarily stop rapidly producing cells. This is to prevent cancer cells from multiplying. Physical or emotional trauma like accidents, injuries, surgeries, death of a loved one. And factors like depression, anxiety, overthinking etc can be the cause of hair loss in men and women. But don’t worry, this hair fall is temporary. Once you get out of that phase, your hair will come back. Dirt, dust, debris, excess oil and pollutants get trapped in our hair and cause damage. While excess bathing is not advised medically. You have to make sure you clean yourself properly. A good wash can remove the above mentioned contaminants and make sure your hair are healthy. Use chemical free shampoos to avoid further damaging your hair and scalp. Use essential oils like coconut/almond/olive/jojoba/mustard. Massage your head thoroughly for 10-15 min. This will improve blood circulation and add vitamins to your hair topically, keeping them healthy. Now that we discussed the basics, let’s come to the point. Another effective way to treat male and female pattern hair loss is by using minoxidil. Minoxidil was discovered when scientists were trying to make a blood thinner (Loniten). They noticed that a side effect of using that medicine made hair grow. More research and studies were done to extract the compound that was responsible for making hair grow. That compound is what we call minoxidil today. Then onward it was manufactured as an independent hair growing product. Minoxidil 5% for Men and Women is recommended to cure Androgenic Alopecia. How Does Minoxidil 5% Make Hair Grow? Minoxidil 5% works by prolonging the anagen phase of hair growth. The formula increases the thickness and length of hair strands. This improves the overall hair quality. A short anagen phase means there will be hair fall eventually. Another major reason for hair loss is the production of dihydrotestosterone (DHT). It is a by-product of the male hormone testosterone. DHT inhibits the follicles and prevents minerals and nutrients from reaching your hair. This eventually causes follicles to shrink from lack of nourishment. Eventually your hair falls out. Minoxidil 5% prevents the enzyme 5 alpha-reeducates from converting testosterone into DHT. This has been proven to be the most effective approach towards dealing with androgenic alopecia. Minoxidil keeps the adenosine sensitive potassium gates open the follicles. This gives way for the minerals to reach the dermal papilla. Hair well supplied with food can live longer and healthier. All or any hair related treatments require patience. Nothing works overnight; you have to stick to the daily routine for a while till you see any results. Minoxidil 5% takes 60-90 days till it starts showing results. Initially there will be hair fall but don’t worry about that. Those are just potentially weak hair that is prone to fall off eventually. This way the weak ones fall and are replaced by new, healthier strands. After a month, new hair strands will start to appear on the scalp. Overtime the thinned areas will be filled with new hair. And continuous use will add more volume to your new hair. 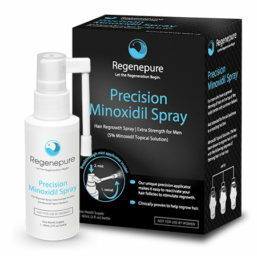 Regenepure Minoxidil precision 5% spray for men and women is one in line of many hair growth products. We have the easy application fine mist spray that makes it easier to apply. The use is simple, just turn the pivoting nozzle and aim directly at the area affected by hair loss. Squeeze 3-5 times and make sure you apply on the scalp. If you leave it on your hair then there is no benefit. After you shower with the Regenepure DR/NT shampoo (alternate use). Apply minoxidil on your now clean scalp, this way it will reach deep into the skin to the area where it is needed. Apply the spray twice a day for faster results and better hair growth.